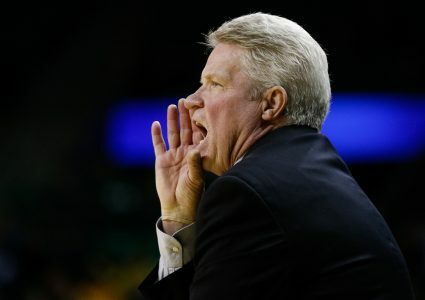 AMES — When Iowa State and West Virginia faced off against each other in January, the Mountaineer defense held Iowa State to its worst shooting night of the season. 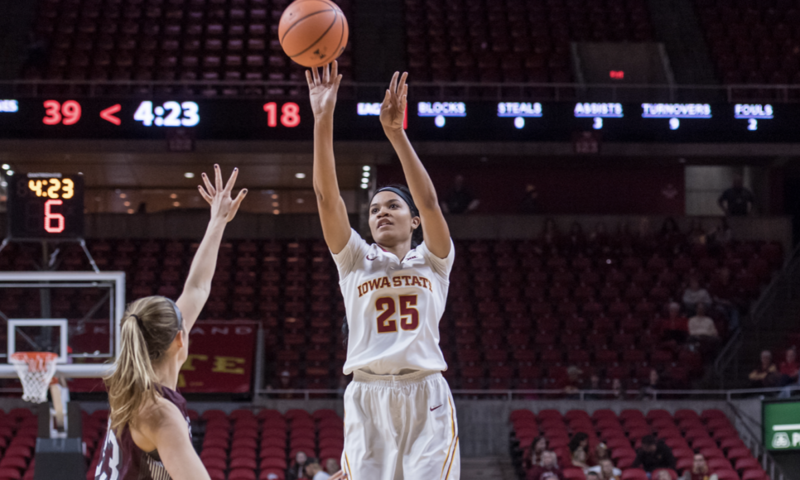 The Cyclones shot 33.3 percent from the field and only made 24 percent of their 3-point shots. On Saturday in Hilton Coliseum, that wasn’t the case. No. 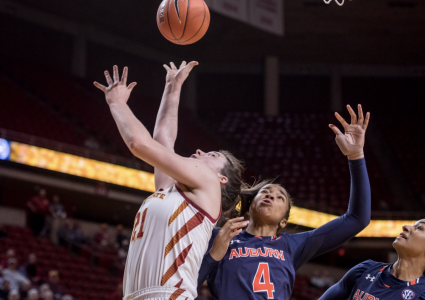 22 Iowa State used a 9-0 run out of halftime to extend what was already a six-point lead as well as a strong third quarter overall to run away with the contest and beat West Virginia 77-61. Kristin Scott finished the game with another one of the best performances of her career. The sophomore led the Cyclones with 29 points on 12-of-17 shooting and added eight rebounds, too. The 29 points were just two away from tying her career record of 31 points that she scored in her 11-11 field goal game against Oklahoma State earlier this year. All-American candidate Bridget Carleton finished the game three assists away from a triple-double. Carleton had team highs with 12 rebounds and seven assists as well as 23 points on the night. As her career winds down in Ames, Carleton spoke after the game about how there are only three home games left for the Cyclones. She’s taking the time to soak it all in, but Carleton’s eyes are on the NCAA Tournament in March. Aside from Carleton and Scott combining for 52 points on Saturday, there wasn’t much noise made on the offensive side of the stat sheet. 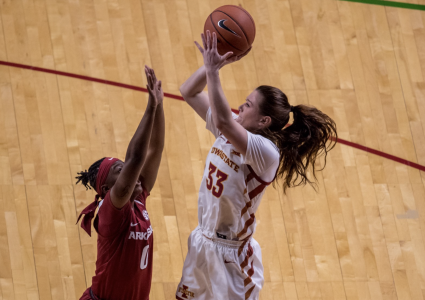 Ashley Joens tallied 11 points in 39 minutes, but she was the only other Cyclone to reach double-digits. Everyone else on the team scored four points or less. However, that didn’t come back to bite the Cyclones, because of the work of Madison Wise. The sophomore out of Greenfield, Indiana was tasked with defending against one of the Big 12’s best scorers in Tynice Martin. Coming into the game, Martin was averaging 17.9 points per game – good for fourth in the Big 12. Wise held her to six points. Saturday’s victory improved Iowa State’s record to 18-5 on the season as well as 8-3 in the Big 12. The Cyclones are now 14-1 this year at Hilton Coliseum. It’s clear that the message was received for the Cyclones, who will travel to TCU on Wednesday after winning five of their last six games. In the two teams’ previous meeting this year, Iowa State bested the Horned Frogs 92-54.